chess set any idea who made these ? Re:chess set any idea who made these ? The manufacturer of the set in question is "Kingsway Inc." made in the USA. The style of the set is trademarked as "Florentine Figurines"
The set in the picture is a fairly early model probably made somewhere between 1947 and 1960. 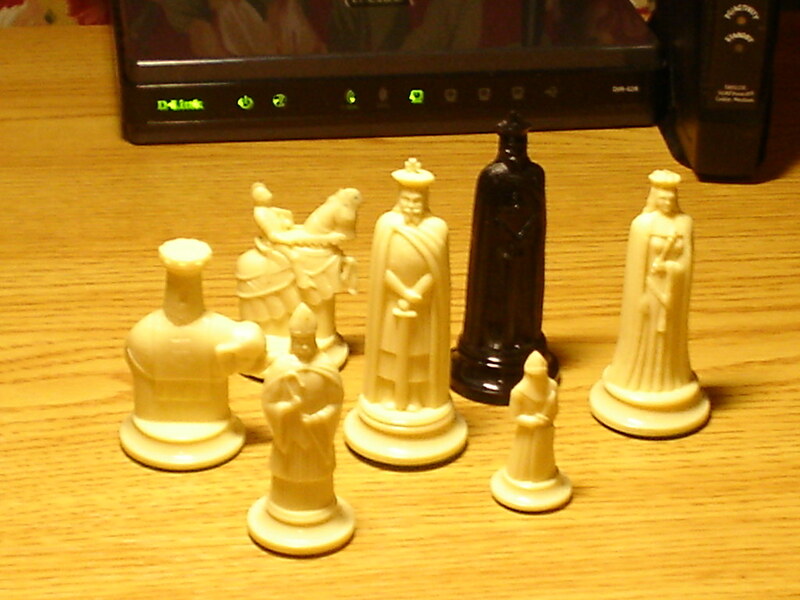 Later on the makers added taller bases to the pieces and pawns bringing the height of the king to over 4 inches. The taller sets usually came in a partitioned box with a 20-page booklet and a folding cardboard playing board that measured 15.5 inches when opened. The board featured a poorly simulated wood surface and a backgammon board on the reverse side. The premium edition of the set came in a padded vinyl box with red pieces and pawns instead of black. Kingsway sold a ton of these sets - there are usually several sets for sale on Ebay at any time. But I didn't see any with an elephant rook. Very unusual. I remember playing with sets with such rooks when I was in Jr High (which would have been 1967-68). I can't be sure they were Lowe but that is my best guess. I have always heard them referred to as Renaissance sets, because they resemble characters from that time period. Alot of different companies made them and I can't tell from the photo but if they are cheap plastic they might be from a company named Lowe. But like I said a lot of places made them. But I am unaware of any computer chess sets which used them. I even had a set my Aunt made in acrylics when she took an art class. Unfortunately the acrylics never properly hardened and they either stuck together or stuck to the tissue paper I wrapped them in to keep them from sticking together.